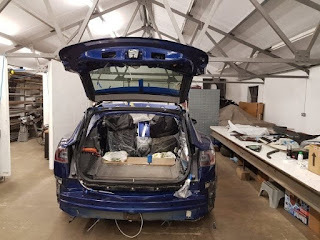 The first Tesla Model S electric vehicle to be converted to a station wagon has been completed by an aftermarket tuning company. This is really good-looking. I love it! Qwest is the first tuning company to complete the transformation of a Tesla Model S to a station wagon. Based in Norfolk, UK, the company through a team of experts made some modifications to a sample Tesla Model S sedan. The result of the conversion is really astonishing. Specifically, the model used was a Tesla Model S P90D. A video as evidence of the successful transformation was uploaded to Twitter by Qwest. New parts were created with carbon fibre to fit the rear and extend the wheelbase to give it a station wagon look and feel. Careful considerations and design changes were applied because of the highly-connected sensors which Tesla equips its vehicles. However, with regular communications with Tesla on methods to apply and sections to touch, the needed support was offered them to complete the project.